This is a work in progress. Displays a small calendar with dates specified using a date/time field in Advanced Custom Fields on a Custom Post Type. Currently assumes a posts to posts connection between two CPTs projects and activities. * Define static values for testing purposes. * Will be replaced with Wordpress options and user input. * Define blank arays to be built up with functions below. 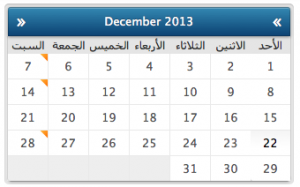 * Defines the days of the week starting with Sunday in English and Arabic. * Extracts various numbers and strings from the given date. * Defines the HTML parts in one place for more readable output function. * Performs the Wordpress query. * Loops through days of week starting with defined starting day. * Builds the table caption with pagination / month name and year. * Outputs HTML before the table. * Outputs the Table Header. * Outputs the Table Caption. * Outputs the Table Body. * Outputs HTML after the table. * Register and enqueue style sheet. * Register and enqueue scripts. * Add style and script actions. For anyone still looking for a soluion, i have created a calendar plugin that works with custom post type and uses ACF custom_date to display the articles. If you need it, email me at : [email protected], and i can give it to you. Right now i am trying to clean it a bit, and will be uploading it to wordpress repository asap.